Director James Orbinski has published Lived Experience of a Record Wildfire Season in the Northwest Territories, Canada. Study Objectives: During the period of June–September 2014, the Northwest Territories (NWT) experienced its worst wildfire season on record, with prolonged smoke events and poor air quality. 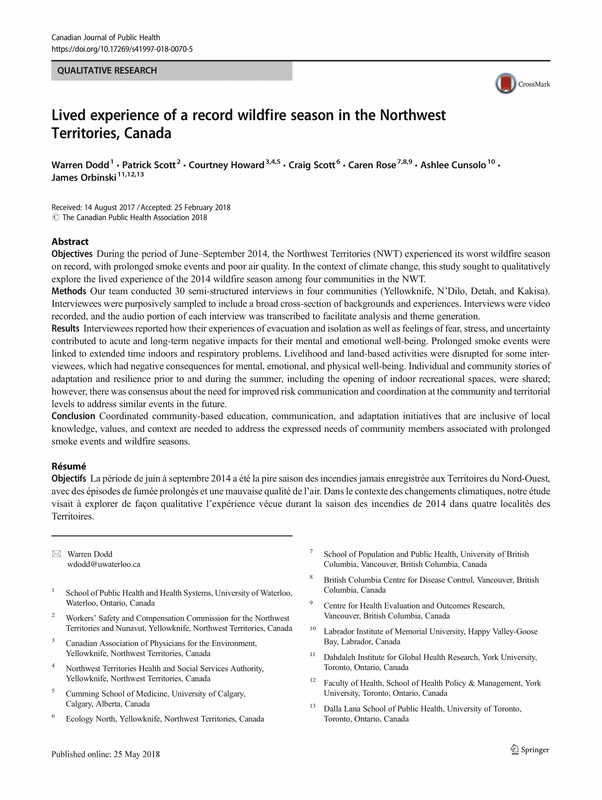 In the context of climate change, this study sought to qualitatively explore the lived experience of the 2014 wildfire season among four communities in the NWT. Methods: Our team conducted 30 semi-structured interviews in four communities (Yellowknife, N’Dilo, Detah, and Kakisa). Interviewees were purposively sampled to include a broad cross-section of backgrounds and experiences. Interviews were video recorded, and the audio portion of each interview was transcribed to facilitate analysis and theme generation. Results: Interviewees reported how their experiences of evacuation and isolation as well as feelings of fear, stress, and uncertainty contributed to acute and long-term negative impacts for their mental and emotional well-being. Prolonged smoke events were linked to extended time indoors and respiratory problems. Livelihood and land-based activities were disrupted for some interviewees, which had negative consequences for mental, emotional, and physical well-being. Individual and community stories of adaptation and resilience prior to and during the summer, including the opening of indoor recreational spaces, were shared; however, there was consensus about the need for improved risk communication and coordination at the community and territorial levels to address similar events in the future. Conclusion: Coordinated community-based education, communication, and adaptation initiatives that are inclusive of local knowledge, values, and context are needed to address the expressed needs of community members associated with prolonged smoke events and wildfire seasons.